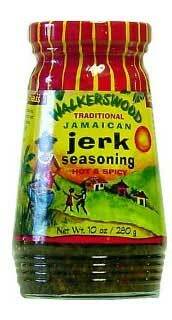 Walkerswood Traditional Jamaican Jerk Seasoning - Jerk is a hot, spicy, uniquely Jamaican seasoning/paste developed over centuries. The combination of scallions, scotch bonnet peppers & aromatic spices in this Walkerswood Jamaican Jerk gives an unforgettable flavor to poultry, meats & fish. Enjoy the original, traditional Jamaican jerk seasoning!!! The dried jerk spice can be sprinkled on seafood, poultry, meat & vegetables. As the dried jerk spice is highly concentrated it should be used sparingly to add zest to salad dressings, omelets, soups, sauces, stews & more. The variety of spices catches up with you, & it is like a carnival where all the elements come together in your mouth. The flavor is so unexpected a taste, in spite of its peppery heat, you'll be dancing for more. One 10 oz. jar marinates approximately thirteen pounds of meat. We recommend using fresh lime juice when marinating with the paste. Marinate pork, chicken & beef not less than eight hours for true jerk flavor, overnight is even better! We recommend marinating fish for approximately 20 minutes before grilling or broiling. Our Tastes of Jamaica gift ensemble includes the Jerk from Jamaica book & makes a great gift for the aspiring BBQ chef & everyone else who loves the heat. Savor the flavor, savor Jamaica!